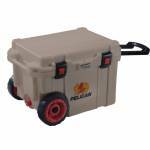 Pelican holds themselves to a higher standard than other cooler makers. "Good Enough" does not cut it when it comes to durability, performance and ergonomic design. Every part is engineered to extreme durability and performance standards * Polypropylene Handles * Large Press & Pull ABS Latches (use with gloves) * Non-Skid & Non-Marking Raised Feet * Molded-In Lock Hasp Stainless Steel Plate with Bottle Opener * Sloped Drain & Tethered Threaded Plug (Garden Hose Attachable) * Corrosion Re..
Pelican’s latest line of drinkware is a go anywhere, do anything, must have addition to your way of life. Ruggedly engineered with 18/8 pro grade stainless steel, featuring a sweat-proof, powder coated finish that ensures your hands won’t slip from condensation, plus a non-Slip rubber base for increased durability. We’ve also made sure that our new Pelican™ Bottles are effortless to transport, as each spill-proof lid is also an easy-carry handle. 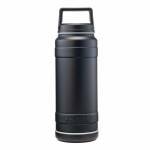 Just loop this through your fingers or attach it ..
Double-wall vacuum insulation 18/8 BPA-free stainless steel Copper plated inner wall Spill-Resistant Lid Extreme cold & heat retention Guaranteed for life 32oz. Black/Stainless ..
Double-wall vacuum insulation 18/8 BPA-free stainless steel Copper plated inner wall Spill-Resistant Lid Extreme cold & heat retention Guaranteed for life 32oz. Realtree Camo/Stainless ..
Guaranteed for Life! 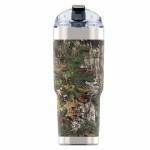 The company that has brought you protective cases for years is now keeping your food drink or game cold real cold. A freezer grade gasket and 2" polyurethane insulation give these coolers 7-10 day ice retention. Up to 10 days ice retention, freezer grade gasket, 2" polyurethane insulation Built-in Bottle Opener Press & Pull Latches (Wide for Gloved Use) Molded-In Tie Downs Non-Skid & Non-Marking Raised Feet Molded-In Lock Hasp, Stainless Steel Plate Sloped..